This is the first post of a previous updated Lucumi Choir Blog. This first post will give anyone thinking of joining more of an idea of the ethos behind the Choir. I will be looking at all aspects of the Choir, from the learning process to issues whilst recording. Here are some of our Aims and Objectives. 1. Community. The choir is a community group. We are run voluntarily and we are not funded. We have a committee and we are governed by a Constitution which we revise every year or so by our members. The most important aim of the Choir is that it is open to all without regard to Race or ethnicity, age, gender, experience of singing, and also religious belief or persuasion. The choir is open to all and one does not have to read music. Nor does anyone have to have any experience. Nor is it necessary to have an audition. It is really unlikely that someone comes to us completely tone deaf. Even people that have slight tuning problems find that singing on a regular basis and listening to other people rectifies their ear and tuning. 2. Religious persuasion. Although the Choir is directed by initiates of the Lucumi religion, the knowledge of Orisha practice is not explored, although the fundamental energies of each Orisha may be explained in order that the members of the Choir can concentrate on each energy as they sing. It is also explained that the songs come from a living and breathing tradition. However ultimately the project is a cultural and artistic representation of the songs and not related to ritual. A healthy respect is demanded between initiates and non-initiates .I ask that there is no probing or investigation into each individual members choice of path. What unites us is the singing and feeling good and positive about doing so. 3. Spiritual Well-being and Health benefits. We have been aware, however that whatever each choir member’s background or belief, all members report a sense of well being after singing and it has become quite an important theme for us as a group. Co ordination, confidence, breath control and respiration in addition to the feel good factor (due to the release of endorphins) are all elements that members have reported on after each session. 4. What we learn: Members don’t ONLY learn about the song sequences and the rhythms and toques that accompany them. Members also learn about how to use their voices so as not to abuse them. We invest in outside tutors such as Singer, Vocal Coach and Choir director: Joyce Moholoagae for extra voice technique and training. We learn about harmony, we learn to listen to each other; we learn about different musical terms and dynamics and how to follow the rhythms in addition to how to follow the director. Movement and co ordination is also taught and we organize trips to different concerts, films and events that may be of benefit to the group in a learning capacity. 5. Performance and Perfection: Rehearsals are regular but we also aim towards performances. This helps the group bond and motivates the Choir to do well. One of my preferred mottos is that community or amateur does not equal low quality. It is important if we play to the general public that we perform to the best of our abilities. 6. Subscriptions: Membership of the Choir is not free. There is a subscription, which helps go towards running costs and paying tutors and percussionists. However no one will be turned away due to financial circumstance and there is a sliding scale available. 7. Charity involvement. We do believe in giving back and have supported various charity organisations over the last couple of years. We have raised money for Heart Research UK and Water Aid. 8. Percussionists: Members of the Choir are from the Community but our percussionists are competent and professional. That is why we are quite an unusual type of choir. There are opportunities to learn more about the percussion but a certain level of competence is needed before being able to accompany the choir in rehearsals and gigs. This is because if the percussion is out of sync, the Choir will inevitably be learning the songs wrong out of time. I ask for respect between percussionists and their different schools of thought and that variation of playing be overridden by (since it is an aural tradition this sometimes happens) the Director of percussion. Percussionists are invited according to their interest in participating and their ability to do so, not on ethnic or geographical origin or gender or race. This is a cultural project and we have women who play in rehearsals in addition to men. 9. Fun Times: The Choir is a great place for socializing in addition to singing, it is a friendly, non- competitive, extremely safe environment. Members come from all walks of life and ages range from 16 to 70 and all in between. This is why my passion persists. I love to get the best from each member of the Choir and I really enjoy teaching the harmonies and hearing the results.10. Progression: Many members of the choir have gained the confidence have gone on to sing in their own Solo projects. 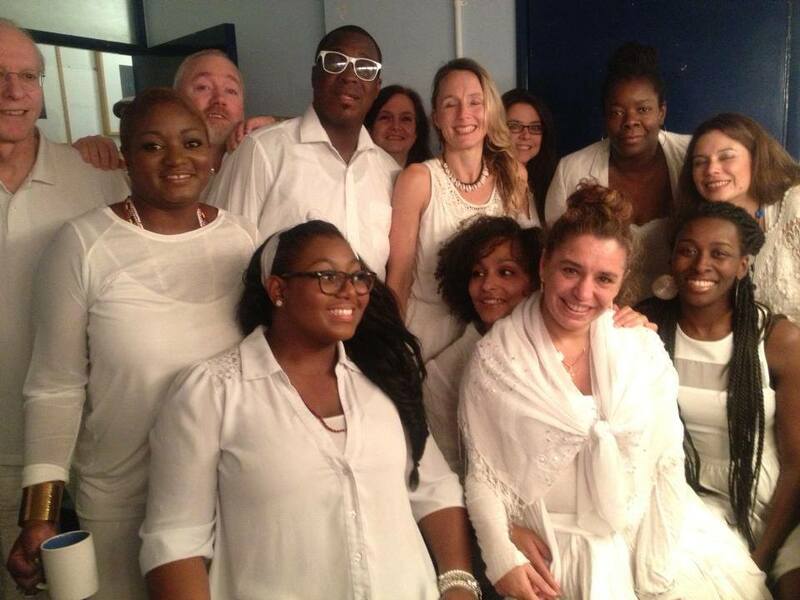 Those who have previously been in the Choir include Eliana Correa ( Wara) and Namvula (Nana) Rennie. Other Solo Singers that sing with the Choir that are also involved in other projects include, Juanita Euka, Nana Clara Aldrin Quaye and Sonia Kounasso. The Choir is a great place to explore Solo Singing and performing an opportunities are given to those that wish to explore this. 11. Commitment: Commitment is important. Because we are a performance group there has to be some level of commitment, but members certainly have a great time and get involved in lots of interesting projects that they may never have had otherwise. Some of those include, playing in the Barbican in front of 1500 people as support for Eliades Ochoa. Supporting Buika in a sell out Venue. Recording a CD, being on TV, being on the Radio. Singing at a Train Station, Singing at a School to excited school children. Every event we do is different and everything is a new experience and a separate challenge. Being on a small platform is as important as a big stage. I hope this will dispel any myths about what the Choir is all about and also encourage anyone who is worried about joining to get in contact! We always need male vocals, by the way! !